Wolfe manor was originally built in 1922 by an Italian immigrant named Anthony Andriotti as a private residence. Its thought the home was built in the grand design it was as part of the owners obsession to keep up with the other people in the neighbourhood, which may explain the ceiling murals and swimming pool in the basement. The manor also had 5 bedrooms and a very impressive ballroom. It would seem that Anthony's obsession with having a more impressive home than his neighbours would be the downfall of the building as only 4 years later he went bankrupt and was forced to sell the home. It seems the loss of his home started the ball rolling for his downfall and he died at the age of 36 from an alcohol induce liver disease. In 1935 the building was bought and turned into Hazelwood Sanatorium to help treat people who were terminally ill, especially those who contracted tuberculosis. The establishment changed its name again in 1942 to Clovis Avenue Sanatorium but maintained the same function, and shortly after in 1950 it became licenced by the department of mental hygiene and had a wing added to treat people with mental disorders. As with pretty much any other sanatorium of the day it didn't have a very good reputation when it came to patient care and this is thought to be the reason for the present day paranormal activity that goes on there. This would be the reason that the building seemed like it would make the perfect place to have a Halloween attraction and this was its next function after it closed as a sanatorium in 1992. Today Wolfe manor is in such a state of disrepair that there is an ongoing battle between the local council and the owner who has to either make some very costly repairs or have it demolished. Its in such a bad state that the local fire department is instructed to not go inside if they are called to a fire there. 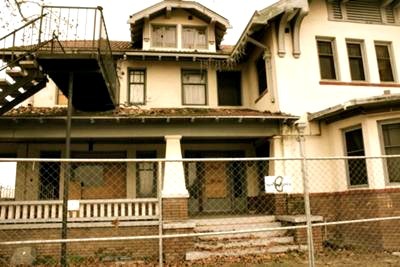 The ghost stories of Wolfe manor has the same foundation as pretty much any other sanatorium of its day. There are tales of patients laying in the hallways naked or being tied to their beds or the toilets. Also overcrowding hit this sanatorium hard as it did with many others and at one time an official report found there to be one nurse to every 20 patients. Talk of suicide and even murders came from the building, with tales of a patient killing a visiting priest by stabbing him in the throat with a pair of scissors and an angry doctor who murdered some of the patients he didn't want to treat or if he became sick of the sight of them. As for tales of the paranormal activity that goes on here there pretty much everything that you can expect. People make claims of app[aritions of doctors and patients and even the original owner who had the house built is thought to still roam the decayed corridors. The basement is said to be the hotspot of the building, and since it was used as a body storage area is certainly has the basis for it. Up to 8 bodies were stored here until someone came to take them away and tales say the storage area was almost always full up.